Of all the things that I love in the world, you have to be close to the top of the list. Probably after my kids, but before the dog. That's where I'd put you. So when I had the chance to review chocolate (are you serious??!!) I couldn't pass it up! I was sent two bars of Bubble Chocolate to review, one milk chocolate, and one dark. Oh yeah, you read that right. Bubble Chocolate. And it is what it sounds like. 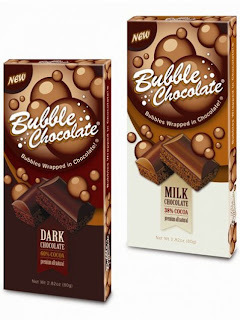 Bubble Chocolate is aerated candy. It's light, and airy, not at all what I expected. But not necessarily in a bad way. It's not a thick, rich bar of chocolate like I'm used to. Bubble Chocolate is produced in Europe, because here in the USA there is just no technology available to produce anything like this. Bubbles are infused throughout the chocolate at just the right time and temperature, and then the chocolate must be molded and cooled so that the bubbles remain inside, but the outside is smooth. There is actually a "method" to eating Bubble Chocolate. You are supposed to break off a small piece, let it melt in your mouth for a few seconds, and then start chewing gently as the bubbles soften. Bubble Chocolate is currently available at Whole Foods, but talks are in the works with Target and Wal-mart. And of course you can always find it on their *website*. Sound Interesting? Wanna try it? The terriffic folks @ Bubble Chocolate wanna let ya! They're giving 5 lucky Flip Out Mama readers a 2-pack of their chocolate. This includes one Milk Chocolate bar and one Dark Chocolate Bar. Extra Entry: For ONE extra entry, become a follower via google friend connect (right sidebar) and leave a comment telling me you did. If you are already a follower (gracias!) just leave me a comment telling me you already are! Extra Entry: For FIVE extra entries, write a post on your blog about my giveaway, and link back here. Leave a copy of the link in your comment so I can check it out. Then leave five comments letting me know! Tiny Disclosure: Bubble Chocolate provided me with two chocolate bars to facilitate my review. That is all. No money! :) Thanks for reading my tiny disclosure. this sounds amazing. i love snicker's too! My favorite is Snickers with almonds! these look tasty *_* i also love m&ms. Yum! I love chocolate! I think I had something similar when I was in Europe! I think snickers is probably my favorite candy! I follow bubble chocolate on fb as Dee G.
Hey thanks for coming to my blog and following me. You Have a great blog. My fave candy too is Reece's Peanut Butter Cups. Love the mixture. My favorite candy is Hershey's chocolate bars. Anyway, Aero is one of my top favorite chocolate bars and I really miss them now that I'm in the US! Bubble chocolate is sooo delicious, I love the melt-in-your mouth feeling! I am new to Follow Tuesday but came across your post about bubble chocolate. 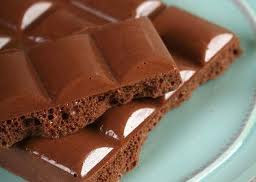 I am from UK but live in USA now - the bubble chocolate has been around for years in England it goes by the name of Aero. It comes in all different flavours - plain, mint, orange. It was one of my favourite chocolates. I didn't realise they were thinking of bringing it here. My fav candy is a twix bar., but maybe I will be switching to Bubble Chocolate once i give it a try! I am a facebook fan of Bubble Chocolate. My favorite is Cadbury with Almonds. It is really creamy and not very sweet. I also like dark chocolates. i also entered you trading phrases giveaway! I entered the Soleo Organics Sunscreen.